This Irish sweatshirt for women is softly shaped for a classic feminine fit and is enhanced with a topstitched 2 x 2 ribbed crossover V neck collar. Additionally the shoulder seams and armholes have triple needle cover stitching as do the ribbed cuffs and bottom band. This feminine, soft brown French terry style, Irish sweatshirt features a 60% cotton and 40% polyester blend. The Irish V neck pullover sweatshirt is embroidered with a Claddagh design that is enhanced with shamrocks and Celtic knots. 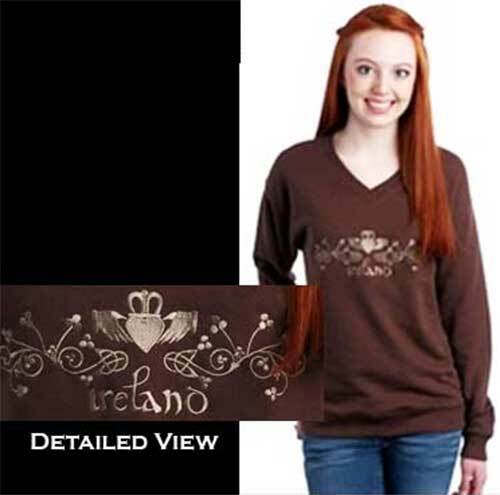 This women's Irish sweatshirt is embroidered in the United States and it is received with the Claddagh legend along with shamrock and Celtic knot history cards, complements of The Irish Gift House.